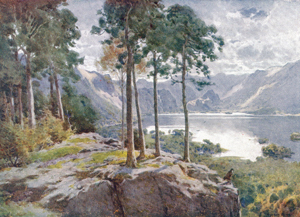 Derwentwater has long been a favourite of visitors to the Lake District, not only for the water itself but for its strategic positioning. From here it is easy to reach the north western lakes, Buttermere and Crummock Water. Bassenthwaite Lake is just a few miles north. Ullswater to the east is conveniently reached along the A66; and going south via St. Johns Vale and Dunmail Raise there is Grasmere and the road past Rydal to Windermere. And this paragraph has mentioned only the lakes; there are also the mountains. Coming to Derwentwater itself one long-favourite viewing point is Friar's Crag, reached by an easy walk past the new theatre (see our page here on Keswick) and along the shore. Much of the lake's shoreline is now in the care of the National Trust. In past centuries there has been mining in the Derwentwater area - for copper, silver, gold, lead and more. This has long gone now, but the industrial archeology of Derwentwater provides endless fascination for some, both with respect to the pre-modern technologies and also their impact on the social and economic life of the area. From the eastern shore as one approaches the head of the lake it is possible to drive (or walk!) up the hill to Watendlath, a hamlet immortalised by Walpole in his Herries Chronicles; from its stone bridge there is a magnificent view to the lake which has provided the subject for many a picture postcard. Coming down again to the head of the lake the Lodore Falls should not be missed, and an expedition into Borrowdale will for readers of Walpole again bring back memories of Rogue Herries and dark deeds in eighteenth century Grange. In summer sunshine this is a place of rural peace; in the damp of a February afternoon as night falls the ancient mysteries of the mountains crowd in upon the unwary traveller. Maybe Walpole would have been better writing about a straightforward respectable family that lived in peace and harmony among themselves and with their neighbours ... but how many people would have wanted to read it? Back again to the lake. Derwentwater (three miles long by something over a mile wide) has several islands, some of which have been lived on over many centuries. When German miners were brought in during the reign of Elizabeth I to improve the technology of the local lead mines there was unrest in the neighbourhood and they were housed on an island for their safety. Lord's Island was owned by the Radcliffe family who became rich from lead mining at Alston. One of this family was made Earl of Derwentwater by James II, but the last earl lost his head for backing the 1715 uprising. Boats can be hired, and rowing on Derwentwater on a warm day is about as good a therapy as can be imagined for those stressed by modern living.